The calling of 12 brethren to serve in the Quorums of the Seventy was sustained during the Saturday afternoon, 6 April session of the 166th Annual General Conference. Elder Merrill J. Bateman’s call to the First Quorum of the Seventy was announced last November at the same time as his appointment to become president of Brigham Young University, but that call was sustained during conference. Also called to the First Quorum of the Seventy were Elder Dallas N. Archibald and Elder Dieter F. Uchtdorf, both of whom have been serving in the Second Quorum of the Seventy. In addition, Elder Bruce C. Hafen was called to the First Quorum of the Seventy (see adjacent story). New members of the Second Quorum of the Seventy sustained Saturday were Elder L. Edward Brown, Elder Sheldon F. Child, Elder Quentin L. Cook, Elder Wm. Rolfe Kerr, Elder Dennis E. Simmons, Elder Jerald L. Taylor, Elder Francisco J. Viñas, and Elder Richard B. Wirthlin (see adjacent stories). 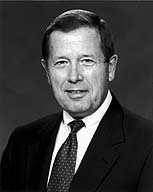 Elder Bateman, 59, was called to the Second Quorum of the Seventy in June 1992, then called as Presiding Bishop in April 1994. 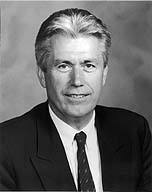 In November 1995 he was called to the First Quorum of the Seventy and appointed BYU president. He began his presidency there on 1 January 1996. Elder Archibald, 57, was named a member of the Second Quorum of the Seventy in June 1992 and is currently serving as president of the Brazil Area. Elder Uchtdorf, 55, has been serving in the Second Quorum of the Seventy since April 1994 and is serving as second counselor in the Europe West Area Presidency.